Kétoslim Max Ultra Thermogenic® is a formula concentrated in slimming active ingredients to help energy expenditure and weight loss, thanks to green tea and Capsimax. It also promotes thermogenesis to accompany you as part of a diet. It has a delicious raspberry taste. Weight gain corresponds to an imbalance between the caloric intake and the energy expenditure of the organism. When increasing energy expenditure, thermogenesis is stimulated contributing to fat oxidation. 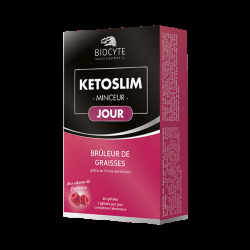 Biocyte innovates and creates Kétoslim Max® Ultra Thermogenic, a dietary supplement concentrated in slimming assets to accompany you as part of a diet. 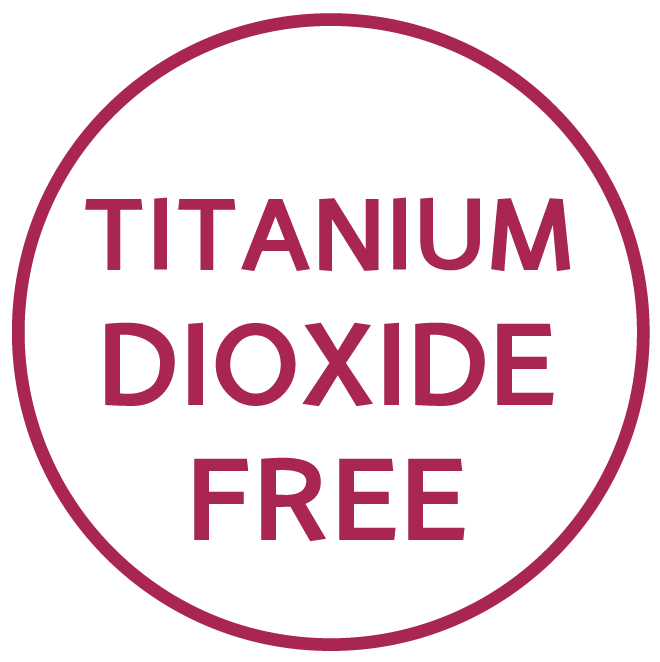 Its formula is composed of raspberry ketones, caffeine, Capsimax®, tyrosine, carnitine and green tea. Green tea extract contributes to energy expenditure and weight loss is promoted by extract of chilli. 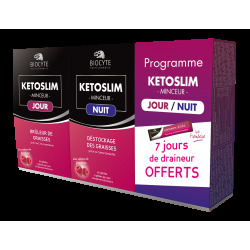 Ketoslim Max® Ultra Thermogenic will give you an optimal dose of active slimming while enjoying you. - GREEN TEA: helps energy expenditure and oxidation of fats, promotes thermogenesis. Pour 250 ml of water over 2 spoonfuls (14 g) and mix until completely dissolved. Consume once a day during a meal. Dietary supplement based on plant extracts, inulin, caffeine, carnitine, tyrosine, vitamins and chrome with sweeteners. Contains caffeine (49 mg per recommended daily dose). Not recommended for children, teenagers, pregnant or breastfeeding women and outside meals. Keep out of reach of young children. Do not exceed the recommended daily dose. Store in a cool, dry place and away from light. Dietary supplements should be used as part of a healthy lifestyle and should not be used as substitutes for a varied and balanced diet.